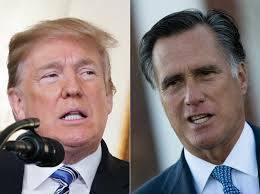 WASHINGTON– Incoming Senator Mitt Romney said Wednesday he was unsure who to endorse for the White House in 2020, saying he would consider "the alternatives" to Donald Trump, whose presidency he said is falling short. The comments on CNN came hours after the 2012 Republican presidential candidate published a scathing op-ed targeting Trump, saying he "has not risen to the mantle of the office" and his actions have alienated America's allies. Concerning the endorsement, Romney said "I think it's early to make that decision and I want to see what the alternatives are." As a senator, he vowed to "vote with my conscience," even if it meant going against Trump and his party. But Romney -- who is preparing to take up his seat in the new Congress -- shut down any notion that he was considering another presidential bid, saying "I've had that experience." "And, by the way, I acknowledge the president was successful. And I was not." Romney's earlier comments seemed to suggest he is positioning himself to take over the role of Jeff Flake, a departing senator who was a vocal critic of Trump. "With the nation so divided, resentful and angry, presidential leadership in qualities of character is indispensable,"
Romney wrote in his op-ed piece in The Washington Post on Tuesday. "And it is in this province where the incumbent's shortfall has been most glaring." He added that Trump's actions had caused "dismay around the world" and alienated traditional allies in Europe. The US leader responded the next morning in a relatively restrained tweet. "Here we go with Mitt Romney, but so fast! Question will be, is he a Flake? I hope not," he wrote. "Would much prefer that Mitt focus on Border Security and so many other things where he can be helpful. I won big, and he didn't. He should be happy for all Republicans. Be a TEAM player & WIN." It is the latest twist in a relationship that has run hot and cold for years. Romney called presidential candidate Trump a fraud and a phony in 2016 -- but last year, he thanked Trump for his endorsement as Romney ran for a senate seat from Utah. In the op-ed piece, Romney noted he had not supported Trump as the Republican Party's nominee in 2016. Romney said he had hoped the Trump campaign would refrain from name-calling and had not. He welcomed Trump's initial inclusion of steady-hand figures in his cabinet like James Mattis as defense secretary and John Kelly as chief of staff. "But, on balance, his conduct over the past two years, particularly his actions this month, is evidence that the president has not risen to the mantle of the office," Romney wrote. The incoming senator said that last month -- when Trump abruptly announced he was pulling US troops out of Syria, and Mattis resigned in protest -- was particularly disturbing. "The Trump presidency made a deep descent in December," Romney wrote. Romney said he will treat Trump as he would any president, either in or outside his party. "I do not intend to comment on every tweet or fault," he wrote. "But I will speak out against significant statements or actions that are divisive, racist, sexist, anti-immigrant, dishonest or destructive to democratic institutions."